If you’ve used Google at all in the past few years (and you’d be lying if you said you haven’t), you’ve likely noticed an occasional, useful peculiarity. Sometimes, when you search for the answer to a question, or for information on a general subject, Google provides a direct answer in a box that’s separate from the usual list of search results. What’s up with that? Sometimes, this is a product of the Google Knowledge Graph, a machine learning system that draws in information from all over the Web to a singular, encyclopedia-like archive, which is then funneled into answers to common user queries. Somewhat related to this are “rich answers" - snippets of information such as short paragraphs, charts, images or recipes that Google pulls from outside sites to answer user queries. If you’re in online marketing, you may be interested to learn that there are ways you can take advantage of these features. Is This a Threat to Search Traffic? First, if you’re involved in a search engine optimization (SEO) campaign or in any way depend on search engines for a share of your Web traffic, you may be concerned about the possibility that these direct answers will interfere with the success of your campaign. Still, reported declines in traffic have been minimal from most quarters thus far, and since you can also take advantage of this situation, you shouldn’t have anything to fear…for the time being, at least. 1. Create your own Wikipedia articles. First, you can work on developing more Wikipedia articles for your brand and any personal brands associated with it. As long as they’re deemed significant by the Wikimedia community, they’ll stay up, so make sure you keep them relatively free of bias and relevant. 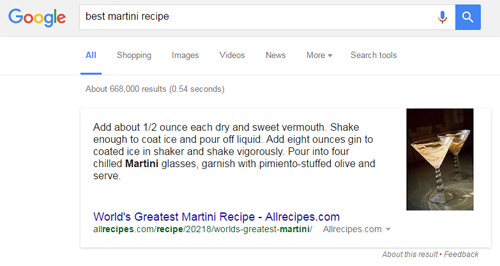 Google relies heavily on Wikipedia for its information, so you’ll develop a higher chance of earning a Knowledge Graph box for branded searches, and a higher likelihood of being featured in “rich snippet” answers as well. 2. Rely on more visual content. This is going to help you in two distinct ways. First, it will increase your visibility in searches. Videos and images often get high priority in search results, so if one of your optimized visual pieces is relevant to a user’s query, you’ll get an instant boost. Second, highly descriptive content with embedded visuals can’t be easily supplanted by a short “rich snippet” -- so you’ll attract more traffic from people who are seeking more in-depth answers to their questions. Google is trying to lock down on all “general” topics and articles. Any question that can be answered easily is answered easily, or will be soon. Instead of writing general how-to and tutorial articles, choose a niche and dig deeper into discussions of more specific facets of the issue. You might see lower potential volume, but you’ll also experience less competition (both from the rest of your industry and from Google). 4. 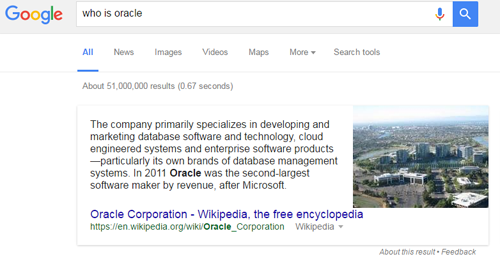 Include structured data throughout your site. Google draws most of its information from outside websites, but if you want to be “seen” by this branch of Google, you need to feed it information through a specific, structured markup. Schema.org is a fantastic resource for learning how to mark up the data on your site, so consult it to ensure that you’re feeding Google all the information you can (like for events in the image below). If you’re informative onsite, there’s a chance your answer will be featured as the rich answer in question, which will certainly give you higher brand visibility and a reputation to follow. 5. Hedge your bets with alternative sources of traffic. As Google’s level of sophistication and reach continue to rise, it may one day become a genuine threat to the profitability of search traffic. In the short term, this isn’t a major problem; but since SEO and online marketing are more long-term strategies, it may be worth hedging your bets. Get involved in social media, personal branding and other peripheral marketing strategies that will help you survive in the event that your search traffic experiences a considerable drop in the future. Google’s Knowledge Graph and rich answers aren’t going away, so rather than fighting them or whining over their existence, make a few tweaks to your online marketing strategy so you can manipulate them in your favor. These strategies probably won’t empower you to hack your way to drawing thousands of new visitors, but they will help you compensate for any traffic you might lose from the Knowledge Graph, and obtain some additional brand authority in the process.